Education is, of course, about so much more than filling minds with facts and figures. Teachers everywhere know that education is about developing minds for all kinds of future experiences: college, careers that will evolve over time, and community and civic life. So how can we know if we are developing minds -- and citizens -- for the future? The right kinds of assessment tell us far more than whether or not students are gaining knowledge. In my previous post, I described Envision School's Know, Do, Reflect (KDR) approach to teaching and learning. The KDR approach is an overall framework that charts a four-year course for students to achieve important milestones on their way to graduation. Students will reflect on how well they've done and what they need to do to improve. Then they will revise their work to make it better. Our expectation is that students will become thinkers, not merely students skilled at regurgitation and armed with test-taking strategies. While test-taking is an important skill for students to acquire, the resulting grade cannot be the end goal. Instead, the goal should be for students to graduate with an arsenal of information and skills that they know deeply and can use in a wide variety of future settings. And while we utilize multiple types of assessment to ensure we are achieving our goals (including in-class formative assessments, project-based exhibitions and standardized testing), our signature assessment method is the Portfolio Defense. This Portfolio Defense process fully engages students in gaining new knowledge and skills (knowing), using the new content for real purposes (doing), and thinking about their own learning (reflecting). The Defense is where they demonstrate how much they have learned and grown, what they have noticed about themselves in the process, and what they will need to improve on to ensure a successful upper division high school experience or success in college. In a defense presentation, each student describes work he or she has done, presents artifacts that represent various skills and competencies, and connects the learning experience to his or her goals for the future. Talking about their learning -- articulating it, reflecting on it, internalizing it -- engages students in the kind of assessment that continually reinforces skills, deepens knowledge, and prepares them for the future. College-ready Coursework. At two of our schools, City Arts & Tech and Impact Academy, 100 percent of African-American and Latino 2012 graduates completed the courses required for UC/CSU eligibility. Statewide, the rates are 29 percent and 28 percent respectively. Also at both schools, 100 percent of low-income 2012 graduates completed the UC/CSU required coursework, compared to 30 percent statewide. College Persistence. While nationwide, only 8.3 percent of all low-income students earn a bachelor's degree by their mid-20s, at City Arts and Tech High School (CAT), where 73 percent of student body is low-income, 72 percent of 2008 graduates and 85 percent of 2009 graduates are persisting in college into their fourth and fifth years. The national college persistence rate for all incomes is 65 percent. Standardized Testing. At Impact Academy, 70 percent of students scored proficient or above on the California Standardized Test for Algebra, compared to 36 percent statewide. Learn: Our students acquire the necessary knowledge and related skills through the deliberate integration of academic content, the arts, and digital media. Our teachers design Common Core-aligned courses, lessons, and projects, ensuring that students learn what they need for their futures. Demonstrate: Our students become experts at showing what they know, through frequent exhibitions and defenses of their work. 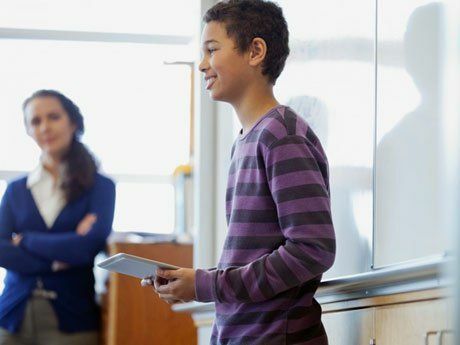 This expectation translates to a more profound sense of connection to the content, and develops students who are motivated by an internal desire to learn rather than by a desire to get a particular grade. One student explains the sense of accomplishment that comes from demonstrating his learning. He says that the process "pushes me a lot harder, and makes me more proud of what I'm learning about. Especially when I can teach somebody else what I learned, it makes me feel better about learning that subject." Reflect: For each assignment, for every exhibition, students are asked questions like: What do you already know? What have you learned along the way? What do you still need to know or do to master the content? How can you revise your work to make it stronger? What have you learned about yourself in the process? These questions engage students to a much higher degree than a lecture-based learning process. They help students internalize their learning and develop the growth mindset that leads not only to future college success but also to life-long learning. As the Stanford case studies illustrate, students are transformed by the Know, Do, Reflect model. At the conclusion of high school, they are ready for college, and therefore better positioned for economic and personal success in their careers, their communities, and society. Join us to see Performance Assessment in action! For more information, visit the Defense Design Studios at Envision Schools.